Nepal experienced a devastating earthquake of magnitude 7.8 at 11:56am local time on April 25, 2015 with epicenter Barpak located in Gorkha district, about 76km northwest of Kathmandu. A second major earthquake hit the country with a magnitude of 7.3 on May 12, 2015. The Barpak earthquake was followed by 450 aftershocks with a local magnitude greater or equal to 4.0 until April 22, 2016. Nepal had not experienced such a natural calamity in over 80 years. This led to widespread impact in Nepal, affecting 31 districts out of 75 and more than 8 million people. As per the data of National Planning Commission (NPC), nearly 9,000 people were killed and more than 22,000 people were injured in the earthquakes and aftershocks. The catastrophe led to extensive damage to physical and economic infrastructure including houses, schools, health facilities, temples, and roads. Over half a million houses were destroyed and over 300,000 were partially damaged. More than 8000 community schools have been affected; more than 25000 classrooms were fully destroyed and more than 22000 were partially damaged. Nearly 1000 classrooms of private schools were fully destroyed while nearly 4000 were partially damaged. 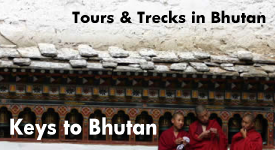 Centuries old buildings, temples and monuments at UNESCO World Heritage Sites within the Kathmandu Valley were destroyed. damage and loss caused by the earthquake is estimated to be USD 7 billion and this is equivalent to about one-third of Nepal’s gross domestic product. Out of 31 affected districts, 14 were declared as hard hit. Kavrepalanchok district in which Pax Earth’s project sites are situated was one of the hard hit districts. Though there were no human casualties in Kot Timal village and Kalikasthan village of Kanpur VDC of Kavrepalanchok, most of the houses which were made from mud, stone, wood and tiles/corrugated zinc sheets were either destroyed or partially damaged from the impacts of the earthquakes and aftershocks. Pax Earth tried to collect information on damages occurred in the Kot Timal village and Kalikasthan village right after the terrific earthquake hit the country but the impact led to interruption of the electricity and mobile network. The organisation has to wait a few days to get actual information about the impact and immediate relief needs in these villages. The immediate need of the earthquake survivors was shelter because they did not have other choices than to spend their days and nights in open sky. Even if there was a partial damage in their houses, the subsequent aftershocks did not let them go inside. The unexpected rainfall and threat of mosquitos were adding further difficulty to their life outside their homes. Right after obtaining the information about the immediate need of the earthquake victims in Kot Timal and Kalikasthan, Pax Earth team geared up to provide an immediate relief by generating fund from members and well-wishers. 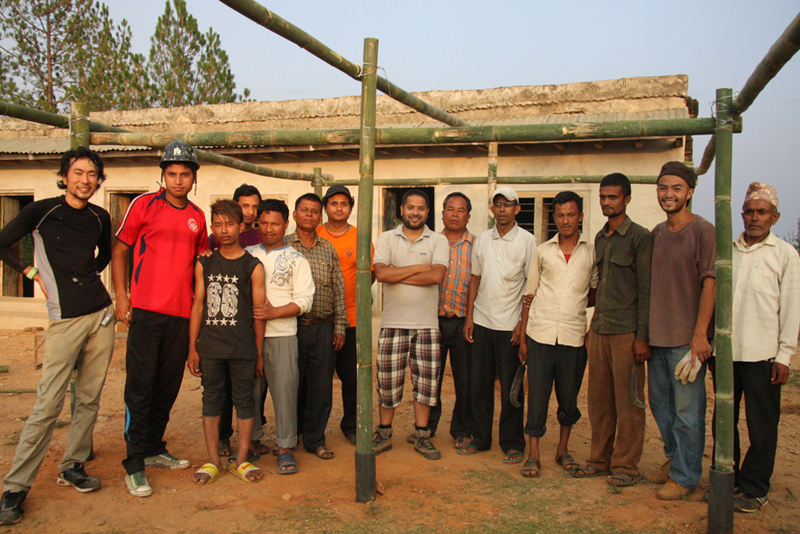 Utilising network of friends and well-wishers, the Pax team could manage to buy 90 tarpaulin tents from eastern Nepal. With these 90 tents, the team initiated relief and rehabilitation activities. Here is a brief highlight of the post-earthquake relief and rehabilitation activities of Pax Earth. 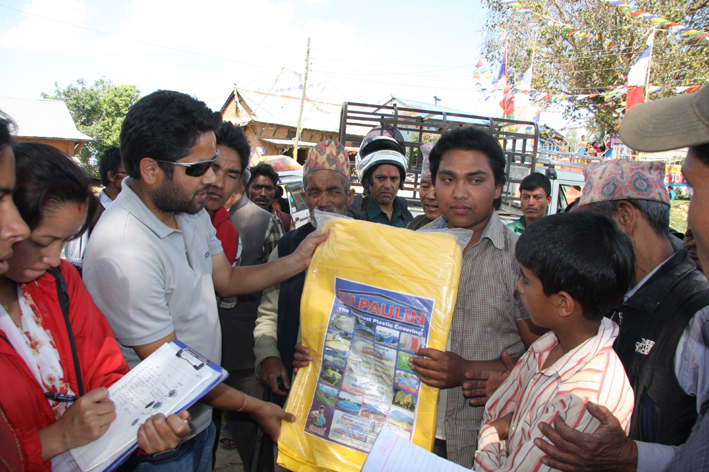 On May 4, 2015, Pax Earth distributed 90 tarpaulin tents (size 15ft x 18ft) to the earthquake victims of Kot Timal village and Kalikasthan village of Kanpur VDC, Kavrepalanchok, Nepal. Though the earthquake affected families were more than double than the number of tarpaulin tents the organisation managed to buy, the senior citizens and local leaders collectively helped in selecting 50 families at Kot Timal and 40 families at Kalikasthan according to the severity of the impact of earthquakes. Despite this effort, the organisation could not provide the temporary shelter to 92 families in Kot Timal and 33 families in Kalikasthan. Pax Earth followed up with friends’ networks as well as organisations working on to provide relief materials to manage tents for the remaining families affected by earthquake in Kot Timal and Kalikasthan. After the continuous effort and follow-ups, Pax Earth could encourage other individuals and organisations to arrange at least one tarp to each affected family not only in Kot Timal and Kalikasthan but also in the entire Kanpur VDC (1041 families in total) in May 2015. 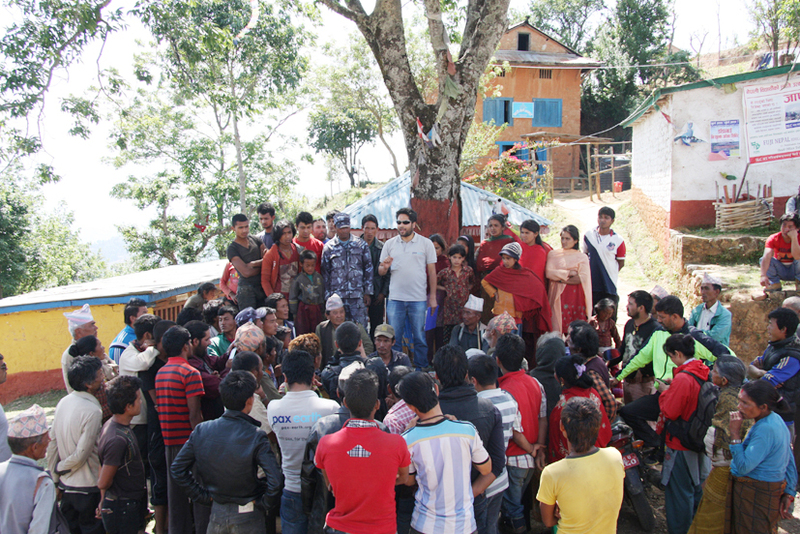 President Sujan Koirala addressing the earthquake victims before the distribution of tarpaulin tents. 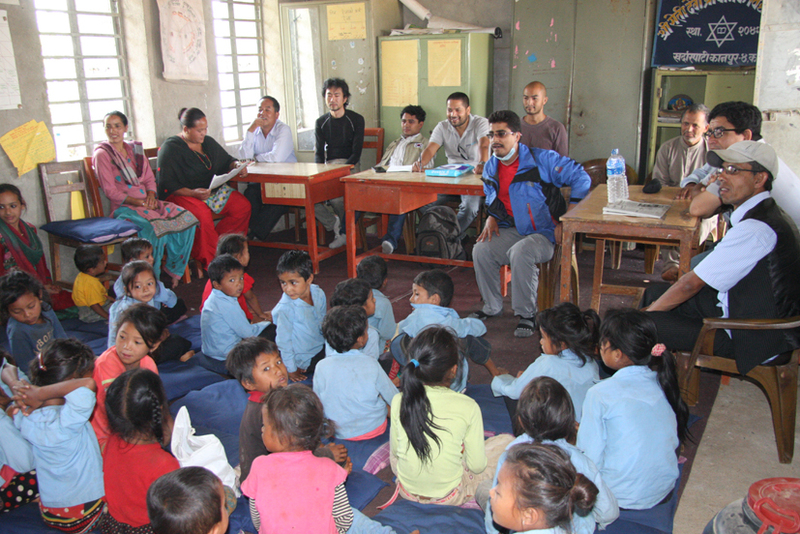 On June 1, 2015, Pax Earth, in collaboration with Iris Nepal, conducted a psychosocial counselling session for the students of Shree Seti Devi Primary School, Shree Kalika Primary School and Shree Raktakali Primary School respectively. 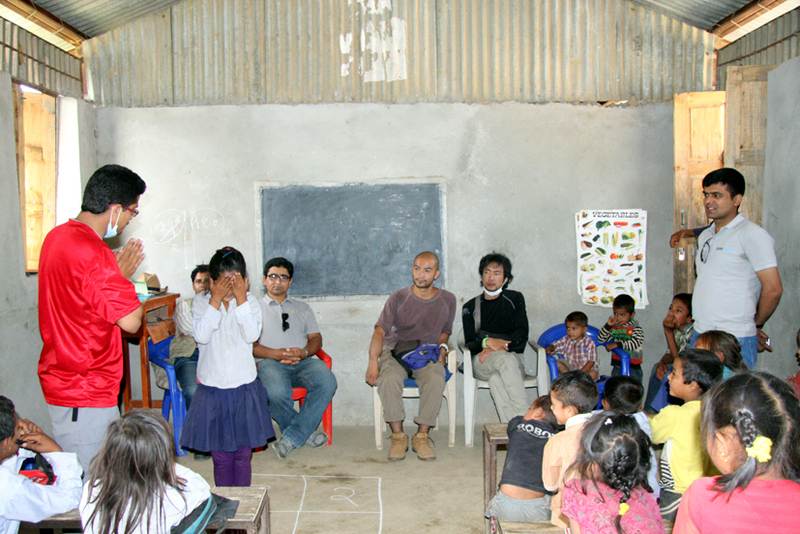 The objective of conducting this session was to help students come out of trauma of earthquakes and aftershocks. 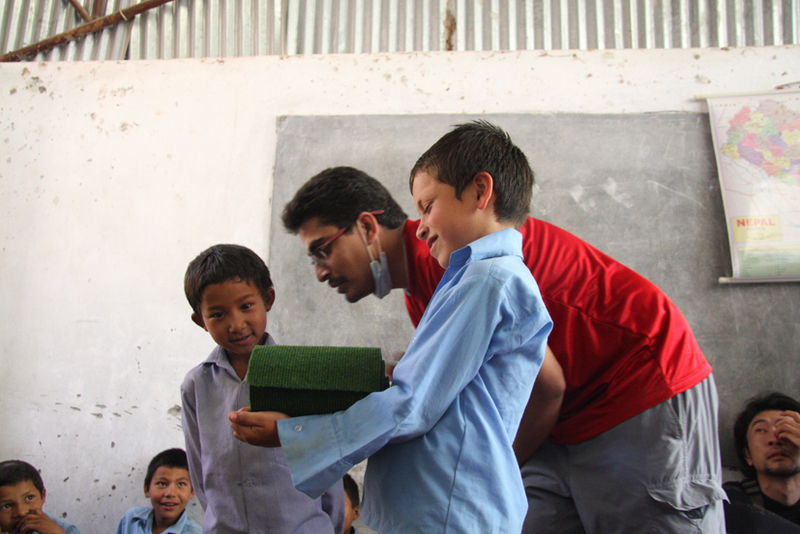 This program helped nearly 200 students to get them out of trauma of the earthquakes and aftershocks. 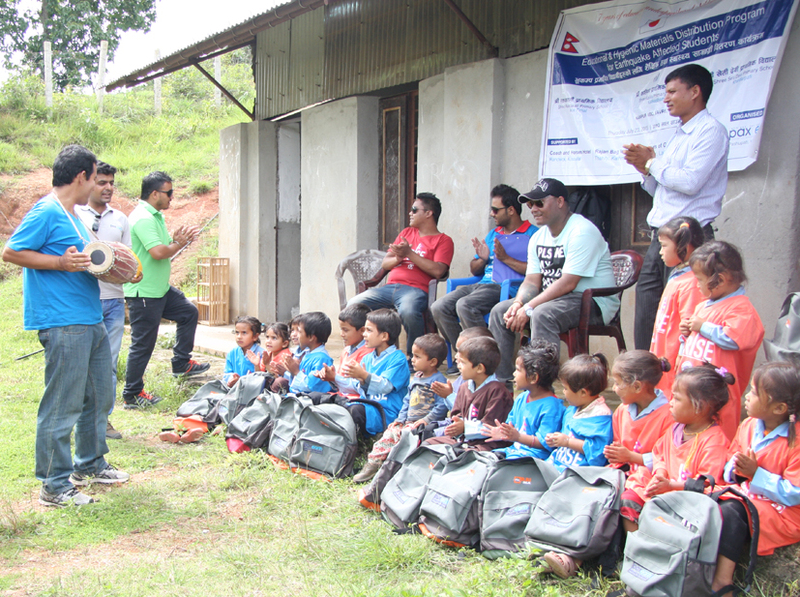 On July 23, 2015, Pax Earth distributed educational, hygienic, musical and sports materials to nearly 200 earthquake affected students of Shree Raktakali Primary School, Shree Seti Devi Primary School and Shree Kalika Primary School in Kavre. Due to the impact of the earthquakes, many students had lost their stationery, carrying bags, toothbrushes, toothpastes, and many items. The main objective of the distribution was to encourage them to go to schools and enjoy their study. The Pax team distributed educational materials such as carrying bags, notebooks, pencils, ball pen, eraser, sharpener and crayons, and hygienic materials such as hanky, toothpaste, toothbrush and soap to each student. The team handed a few sports materials and musical instruments to the schools as well. 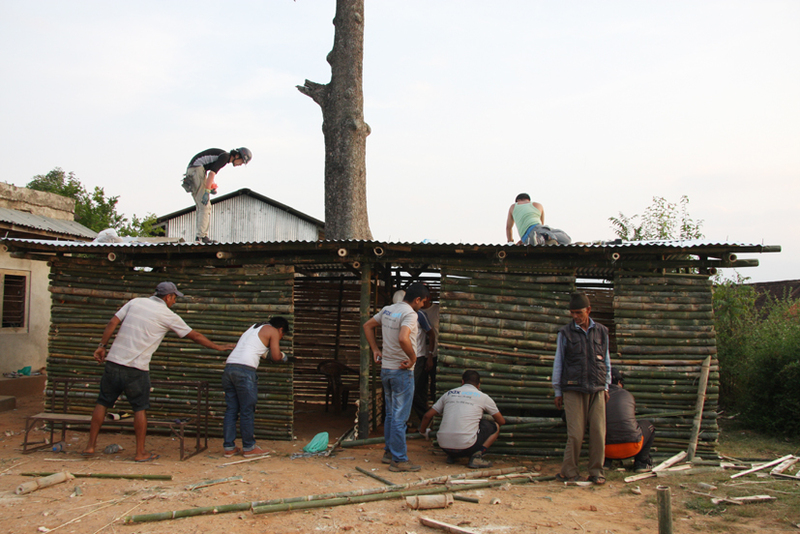 Pax Earth supported in construction of two temporary buildings utilizing the local bamboos and corrugated zinc sheets. 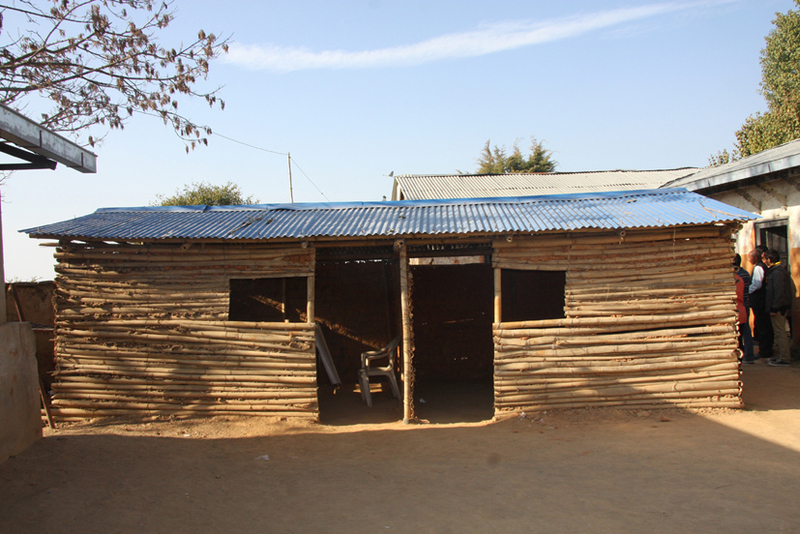 The first temporary school with two rooms was constructed at Shree Seti Devi Primary School where classes from childcare to class five were running. An old building of the school with four rooms was destroyed by massive earthquakes of April 25, 2015 and May 12, 2015. 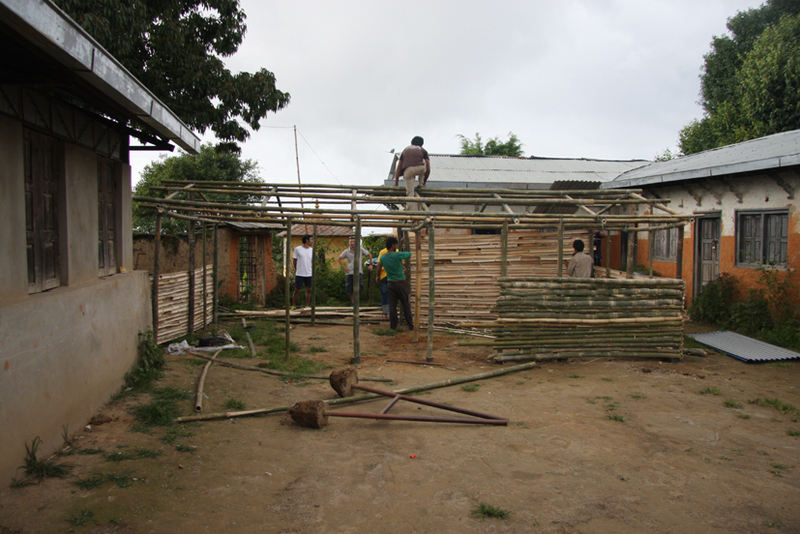 Pax Earth members, well-wishers, teachers and community people thoroughly involved during June 3, 2015 and June 5, 2015 to construct the temporary school. 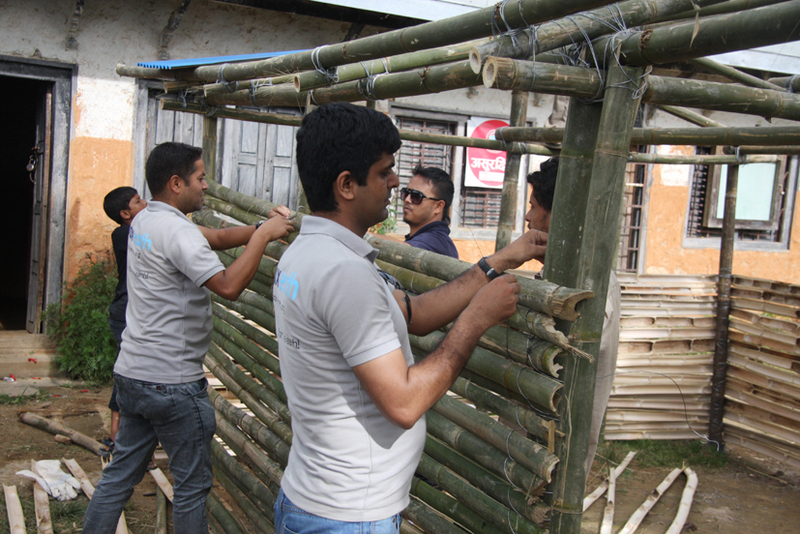 The structure and the wall of the temporary building were built from local bamboos while roof was made from corrugated zinc sheets. 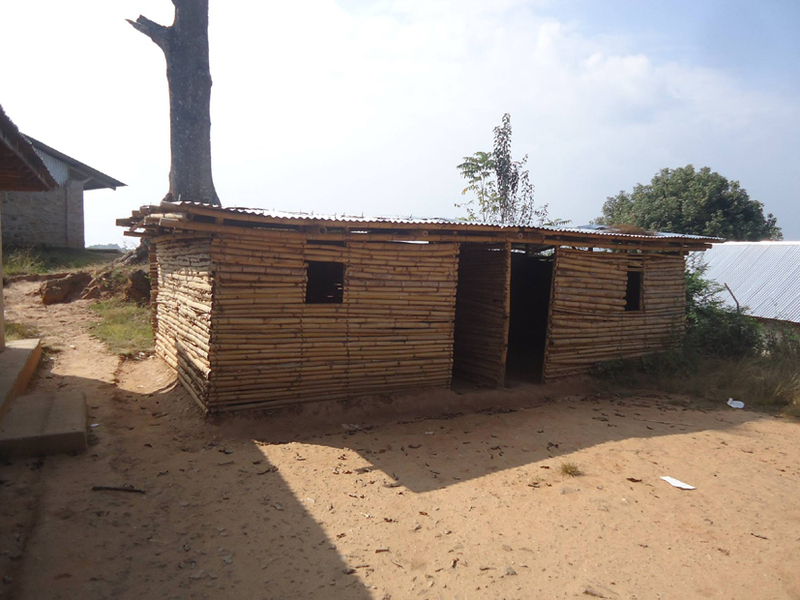 Similarly, Pax Earth constructed a two-room (temporary) building for the students of Shree Raktakali Primary School, Kot Timal, Kavre utilizing the local bamboos for structure and wall and corrugated zinc sheets for roofing. The old building with five rooms was destroyed by the earthquake on April 25, 2015 and subsequent aftershocks. 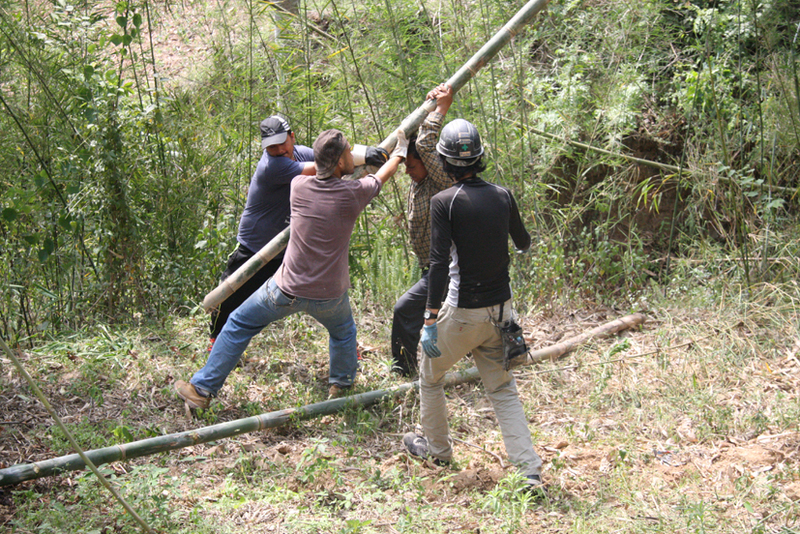 Pax Earth members, community people and teachers collectively worked to complete the construction during September 20, 2015 and September 25, 2015. 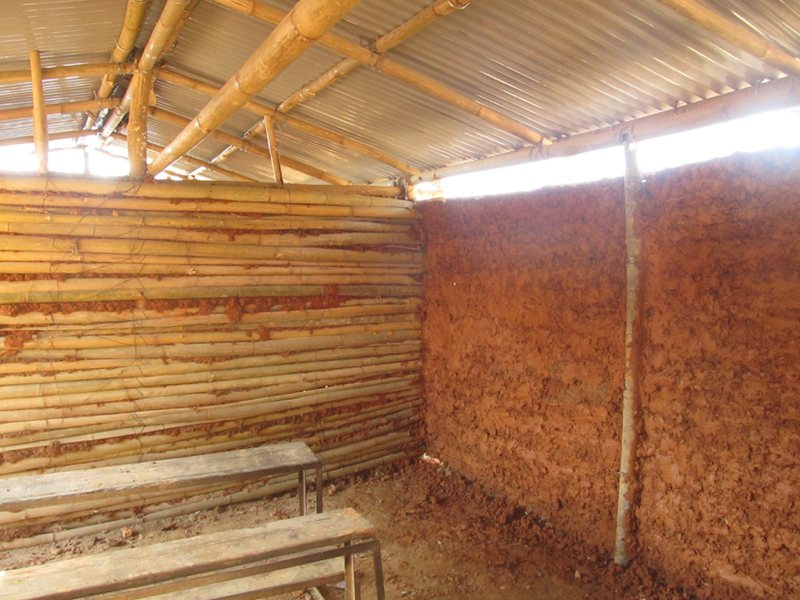 The bamboo walls of temporary classrooms of Shree Seti Devi Primary School and Shree Raktakali Primary School were covered with mud from inside in October 2015 and December 2015 respectively. 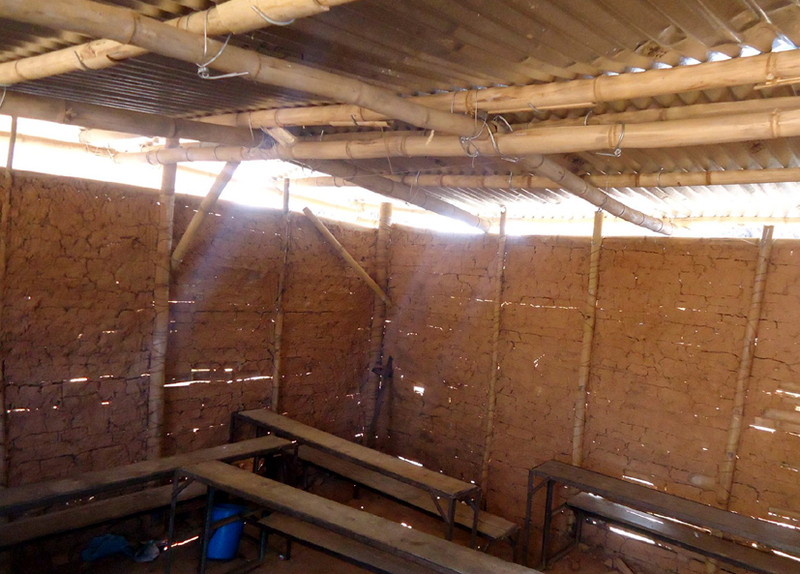 The main objective behind covering the bamboo wall with mud was to increase the life of temporary schools and also to provide a warm classroom environment in the winter time. It was quite encouraging to see the students are enjoying studying in these temporary schools. 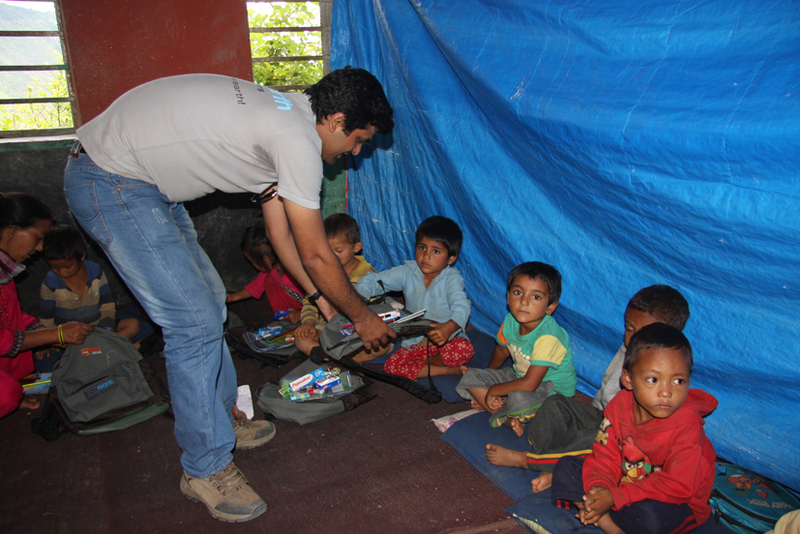 On February 18, 2016, Pax Earth distributed educational and hygienic materials to nearly 200 earthquake affected students of Shree Raktakali Primary School, Shree Seti Devi Primary School and Shree Kalika Primary School in Kavre. 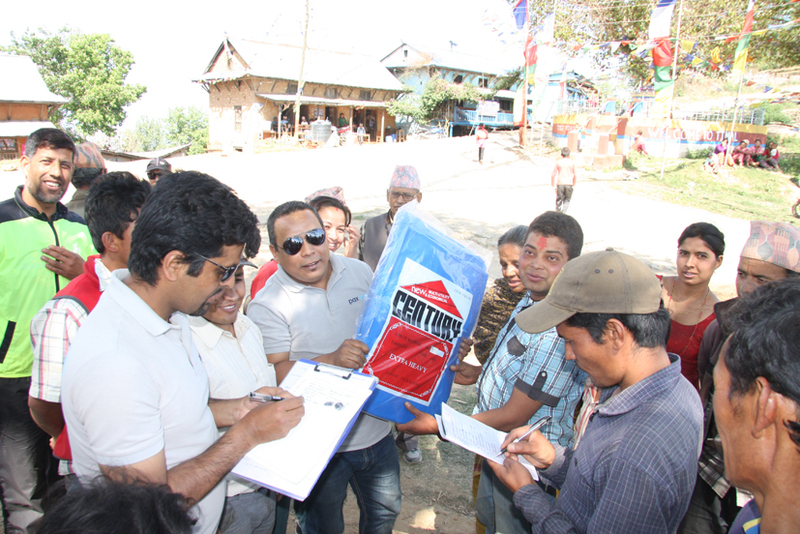 The main objective of the distribution was to support the earthquake affected students in their study and thereby to reduce the economic burden of their parents to buy the stationery and hygienic materials to some extent. Pax Earth distributed educational materials such as notebooks, pencils, ball pen, eraser, and sharpener, and hygienic materials such as toothpaste, toothbrush and soap to each student. 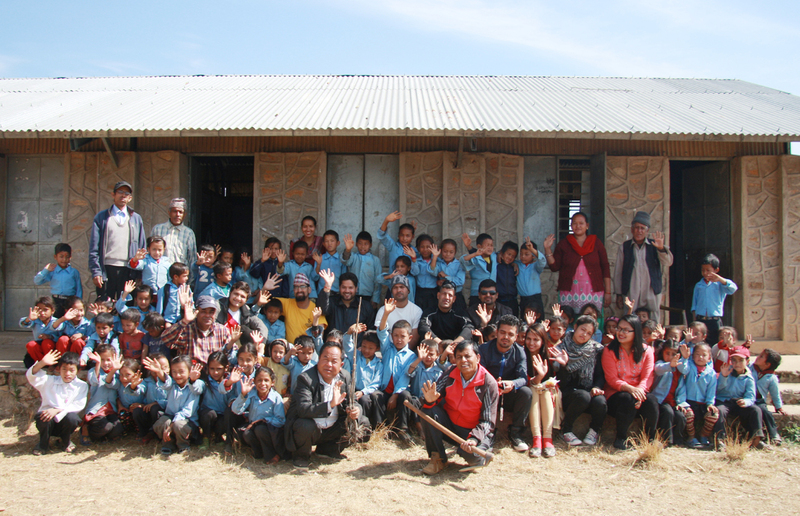 The Pax Earth team was quite delighted to observe the temporary schools of both Shree Seti Devi Primary School and Shree Raktakali Primary School were utilized properly. In both these schools, class 4 and class 5 have been smoothly running. Pax Earth members (Nepal and Japan), well-wishers, collaborators, teachers, students and community people extensively involved in carrying out the relief and rehabilitation activities for the earthquake victims in Kanpur VDC, Kavrepalanchok, Nepal. All these activities were carried out based on the real need of the earthquake victims and the financial capacity of the organisation. Our focus in future will be to improve the livelihoods of the earthquake victims in Kot Timal, Kavre by enhancing their capabilities to tackle particularly scarcity of water through creating sustainable projects. The scarcity of water has been impeding the village from possible development. Pax Earth would like to express a humble gratitude to all the individuals and organisations for their kind support in providing relief and rehabilitation to the earthquake affected families and students in Kot Timal village and Kalikasthan village of Kanpur VDC, Kavre, Nepal. Pax Earth would like to thank PEJ President Dr. Soko Aoki, PEJ members and well-wishers from Japan for raising fund to provide relief and rehabilitation to the earthquake victims in Nepal. Pax Earth is equally thankful to the main supporter Shoyu Club for their support and contribution in carrying out the relief and rehabilitation effort. Pax Earth Relief and Rehabilitation team headed by President Sujan Koirala along with Secretary Binod P. Mainali, Treasurer Bal Gopal Shrestha, Board Members: Kamala Basnet and Jamuna Siwakoti, member Peter Badal and well-wisher Prabin Giri deserve a special thank for raising fund to purchase the tarpaulin tents. Pax Earth is thankful to Koirala community of Kot Timal particularly advocate Kedar Koirala, Keshav Prasad Koirala (Dinesh), Arjun B. Koirala, Puspa Raj Koirala, Narayan Koirala, Ram Prasad Koirala, Ramesh Bahadur Koirala, Shreeram Koirala and Shiva Sitaula for sponsoring about 45 tarpaulin tents to distribute for the earthquake victims in Kot Timal and Kalikasthan. Pax Earth is thankful to Sanjay Kumar Pant and Ashok Mainali from Iris Nepal for their support in conducting psychosocial counselling sessions at Shree Seti Devi Primary School, Shree Kalika Primary School and Shree Raktakali Primary School in Kavre respectively. Pax Earth is grateful to our well-wisher Ryohei Ohkusa for his design, hard work and guidance for the construction of temporary school buildings. We are thankful to Hon. Member Nilambar Badal and Ek Lal Neupane Sir (Admin and Finance Director) of Asian Human Rights and Culture Development Forum for their valuable inputs and suggestions in the design work. We are quite thankful to members: Debraj Ghimire, Kapil Deuja, National Representative for Australia Saroj Ghimire, well-wishers Suraj Acharya, Udaya Banskota, Bee Café, Dawn Hodgman and Kalpana Rayamajhi for providing financial support in making temporary buildings at Shree Seti Devi Primary School and Shree Raktakali Primary School. Hats-off to Pax Earth Rehabilitation team headed by PEN President Sujan Koirala along with PEJ President Soko Aoki, Chairman of Athlete Society Dai Tamesue, Secretary Binod P. Mainali, Board Member Laxman B. Pahari, member Sachin Koirala, Peter Badal, Prabin Giri, Onishi Katsuaki, Ram Acharya, Srikrishna Sapkota, Rajan Dulal, Harindra Lal Shrestha, Sunil Tamang, Anand Dhital and Ratna Lama for their voluntary work to construct the temporary school rooms at Shree Seti Devi and Shree Raktakali. We are indebted to principals, teachers, school management committee members and community people for their active participation in the construction of these temporary school buildings. We are equally thankful to the volunteers from Nawa Amarkanteshwor Youth Club for their active involvement in the constructions. 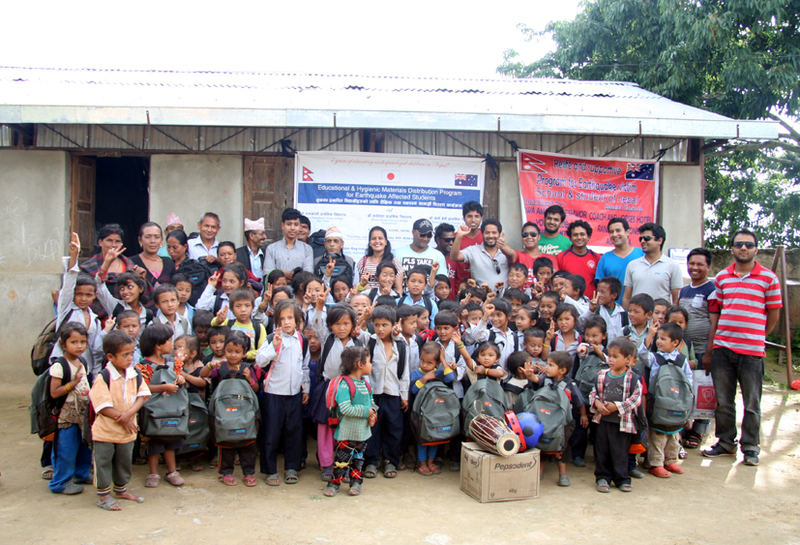 We would like to thank Coach and Horses Hotel (particularly Pradip Giri for coordination), Rajan Bag Industry (particularly Rajan Dulal), teachers of GEMS (particularly Pramila Amatya) and well-wishers Ashis Khadka, Devinder Thapa and Rounik Aryal for sponsoring educational, hygienic, musical and sports materials for the earthquake affected students of the three schools in Kavre. To recapitulate, we would also like to thank all the volunteers and supporters, even if we missed to mention any name(s) above, for their direct or indirect supports in carrying out the relief and rehabilitation activities in Kanpur VDC of Kavrepalanchok successfully. It was a network of members, well-wishers and supporters which collectively helped to carry out the relief and rehabilitation missions to meet the real need of earthquake victims in Kot Timal village and Kalikasthan village, Kanpur VDC, Kavre, Nepal to some extent. Please keep loving and continue supporting Pax Earth.